In today's blog we will take a look at South Africa's interest rates in more detail of comments from the Reserve Bank about where they would like the real repurchase rate to be. The real repurchase rate (real repo) rate refers to the repo rate the Reserve Bank lends money to regular at after removing inflation. Today's blog is brought about after this article was published by Fin24.com in which the following is said and we quote "The South African Reserve Bank's (SARB's) recently-released monetary policy review showed the bank is taking a more hawkish stance as it wants the real repo rate to be at 1.5%, said Els. The bank forecasts inflation at 3.5% with no more room for rate cuts." As can be seen from the line chart above, Taylor, Actual Interest Rates and the Interest Rate wanted by SARB follow very similar trends, while the magnitude is a lot different. 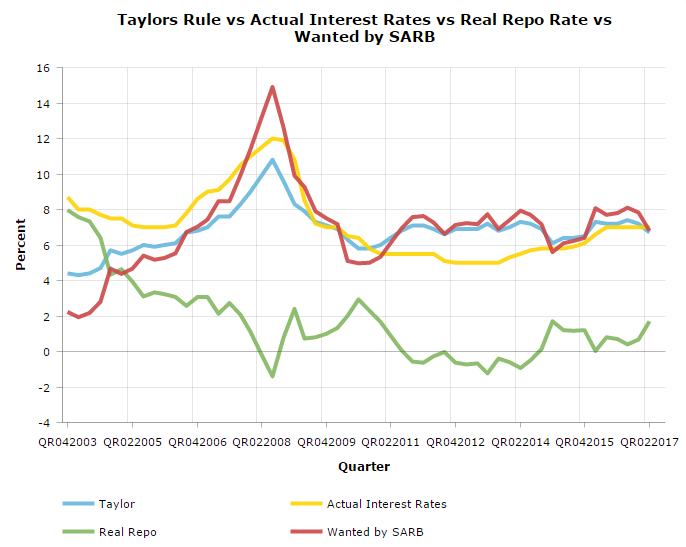 The announcement by SARB regarding the 1.5% real repo explains why actual interest rates at end of 2007 up to end of 2009, far outpaced the interest rate as recommended by Taylor's rule. But it is a lot closer to the "wanted" rate by SARB. Concerning is the lack of detailed communication by SARB on their monetary policy setting process and what they actually look at when deciding on monetary policy at the Monetary Policy Committee (MPC) meetings. Their forecasts of inflation has been horribly wrong as we have shown and discussed numerous times on our website and interest rate policy setting is dependent on their forecasted levels of inflation. And now a real repo of 1.5% is thrown into the mix making it even harder for market participants to anticipate interest rate setting policy by SARB. As Johann Els mentions in the Fin24 article above "We are disappointed by the Reserve Bank’s recent lack of clear communication with markets, having chosen to surprise the markets both in July and September.” This approach is different to global central banks, which have tried to guide markets instead of surprise them". We as market participants would prefer being guided by SARB on its policy stance and setting instead of being surprised by cuts when no one expects it and then not cutting when everyone is expecting it. With inflation ticking up from 4.8% in August 2017 to 5.1% in September 2017, readers should not expect any more interest rate cuts from the Reserve Bank in the short term, as we suspect they will adopt a wait and hold approach to see what happens with the exchange rate as well as predictions by Graan SA (Grain SA) that food prices should come down steadily next year due to over supply of maize in SA.